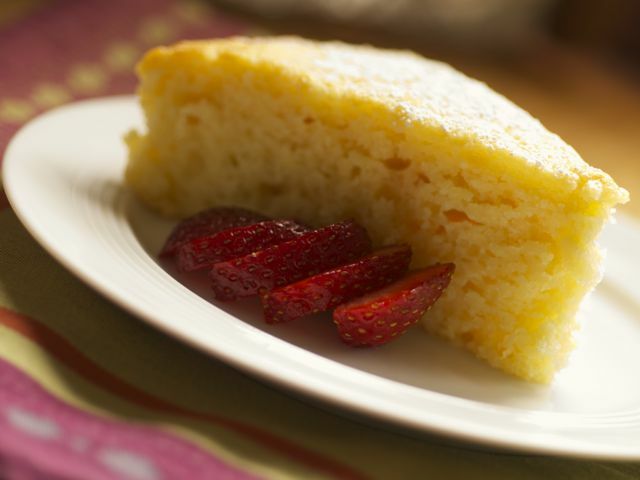 Aside from the fact that I always have the ingredients for this cake on hand, I often turn to this recipe because of its light and airy texture and straightforward flavor, perfect for when everyone in my family is craving "just plain cake." Although its name isn't very glamorous, it can be dressed up in a hundred different ways. One of my favorites: Place a paper doily on top before dusting it with confectioners' sugar to create a lacy decoration, and serve with sliced seasonal fresh fruit and yogurt on the side. Whisk together the flour, sugar, baking powder, baking soda, and salt in a large mixing bowl. Whisk together the yogurt, oil, eggs, and vanilla in a medium mixing bowl. Pour the yogurt mixture into the flour mixture and stir until just moistened. Let the cake cool in the pan for about 5 minutes, invert it onto a wire rack, and then turn it right side up on a rack to cool completely. Dust with confectioners' sugar, then slice and serve.